People of Camberwell now get our top-notch gas ducted heated cleaning. Toms Duct Cleaning Camberwell professionals are just a call away. Call us on 1300 068 194 to get same-day, on-site service. We believe in making your heating appliances and ducts as good as new! Duct cleaning and Vent Duct Cleaning is one of those tasks that it’s easy to forget about. Since ducts and vents are often overlooked, many homeowners might not even remember the last time they had them attended to. Duct Cleaning eliminates contaminants such as mold, fungi, bacteria, and very small particles of dust from your HVAC system, and should be considered as one component in an overall plan to improve indoor air quality. Heating, ventilation, and air conditioning (HVAC) systems have been shown to act as a collection source for a variety of contaminants that have the potential to affect health. The fact is, however, that duct cleaning may have health advantages, and might even reduce your energy bills and extend the life of your forced air system. Toms Cleaning provides professional Air Conditioning Duct Cleaning services, We have Certified team for complete HVAC System Cleaning services. Call us today on 1300 068 194 for free quote. Every time your A/C system turns on in your home it circulates air throughout ducts. This process carries the dust and debris that gets collected in your home just through everyday living. This constant cycle of dust build up and distribution can have serious effects on your home’s cleanliness and your family’s health. Constantly blowing these allergens will irritate any allergy sufferers throughout the year, even when it may not be “allergy season”. If you’ve looked at your vents and can see the dirt layered on, it’s time to get a cleaning! Having this maintenance service performed will remove accumulated dust and dirt so it won’t be spread throughout your house/office. Plus, removing the debris increases the efficiency of your A/C system by as much as 40%. In some homes, debris builds up in the ductwork system quickly enough that you’ll see the effects around your home or with a quick look inside the ducts. Dirty ducts blow dust, lint and other debris into every room of your home. If you find you need to dust your furniture every other day or so, it’s a sign your heating and cooling system needs a good cleaning. Your supply registers also offer a clue. If they release an initial puff of dust whenever the heat or A/C turns on, it’s time to clean the registers and possibly the rest of the system, too. When moisture is present in your ducts, all it takes is a few mold spores to start off a fungus problem. Take a look inside your sheet metal ducts. Patchy discoloration in brown, white, green or another color is likely to be mold. Any sign of moisture buildup or water stains from previous leaks also suggest mold could be growing somewhere in the ducts. Ductwork is a tempting source of shelter for mice, caterpillars, wasps, and other rodents and insects. All of these pests leave behind biological contaminants such as droppings, hair, nesting material and dead insects, which pose a threat to your health. Worse yet, allowing pests to hang out in your ducts gives them a chance to spread to other parts of your home. When a home is built or refurbished, it’s common that construction debris ends up in the ductwork. Even brand new ductwork could be harboring sawdust, dust from drywall and plaster, insulation and carpet fibers, and residue from the gaseous pollutants given off by paint, varnish and other substances. Drywall dust is particularly important to remove because, if ignored, it can circulate for several years, forming a hard-to-remove film inside your ducts. This buildup also provides a source of nutrients for mold, potentially creating two problems in one. If you’ve moved into a previously owned house, don’t assume the ducts are clean just because the rest of the house and the supply registers look clean. Unless you have documented proof a duct cleaning was performed within the last five years, the condition of the ducts is anyone’s guess. It’s Time to Clean Your AC Ducts! Having your AC ducts professionally cleaned by Toms Duct Cleaning expert means greatly reducing the amount of dust, dirt and mold in the air your family breathes. Toms Air Conditioning Duct Cleaning experts are highly trained to identify your home’s or office’s duct system and use the latest tools to extract the most dirt, debris, pollen, mold, dander, hair and other particles from your house / office. 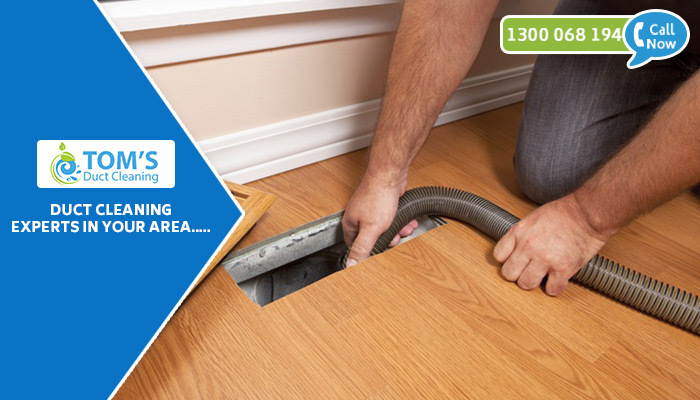 Toms Duct Cleaning Camberwell technicians will utilize powerful equipment to clear your air ducts of dust, debris, pet dander, allergens and grime. This powerful suction technology essentially vacuums out years of accumulated dust from the a/c ducts, leaving them clean and clear. Once finished, your home air quality will be better to breathe for your family. There are two ways of duct cleaning and duct vent cleaning services. One system is connected into the ducting to provide suction. A high-pressure air hose is passed through the ducting to remove the particles from the interior. The other system uses a large specialized vacuum attached to a hose and a brushing system that is run through the ducting. Both systems are effective when operated by properly trained personnel. The experienced technicians at Toms Air Conditioning Duct Cleaning are dedicated to providing quality air duct and vent cleaning service and maintaining your air conditioning & heating units. Dedicated to a healthier air environment, the team at Toms Duct Cleaning Camberwell provides free estimates and will explain exactly what you need, why you should consider it, and how it will help to maintain cleaner, healthier living. A proper cleaning should include the following: cleaning of all registers, inside the ducting, and the interior of the heating and ventilating system. The furnace fan must be cleaned, and if you have air conditioning or a heat pump, the coils inside the system must also be thoroughly cleaned. Finally, a disinfectant can be fogged through the cleaned system to eliminate any mold, bacteria, and dust mites that might remain. Proper duct cleaning of a home should take a minimum of three to five hours, depending on the size of the house. If the home has more than one heating and cooling system, or the system is located on the roof, it can take longer. Proper Air Duct cleaning ensures that the air you breathe is clean and free from contaminants. Allergies are aggravated by the dust and other particles distributed through your HVAC system. Odours are also eliminated. Regular HVAC system cleaning allows systems to run more efficiently. Clean, efficient systems are less likely to break down and have a longer life span. Efficient systems use less power – saving you money. Dust accumulated in the air ducts make an ideal place for germs, fungus and other things to live and breed. Your HVAC system will distribute these germs through the offices, increasing the chances of spreading airborne diseases. Regular Air Duct cleaning reduces the number of places for germs to breed and multiply. During the winter months, staff are more likely to come to work with colds and flu. Germs are spread via your Air Ducts, where they also have a perfect place to breed, especially if there is a lot of dust and dirt. Regular cleaning will ensure that germs have no place to breed and fewer germs are passed from one staff member to another. AC Duct Cleaning: An essential factor is that the heating, ventilation and air conditioning (HVAC) duct work systems must be kept clean and Toms Duct Cleaning does it efficiently. Evaporative Cooling Cleaning: We also provides Evaporative cooling cleaning services, our certified duct cleaners can complete work efficiently with 100% customer satisfaction. Duct Repair: Duct repair is one of the keys to ensuring efficient operation of your HVAC system. We will inspect your home or office to identify problem areas and recommend solutions such as duct sealing, duct repair, and duct insulation. Floor Duct Cleaning: We offer cleaning for not only ceiling ducts, but also floor ducts. Ducted Heating Cleaning: Along with cleaning Toms Duct Cleaning Camberwell provides maintenance of Ducted heating & cooling equipments. Dryer Vents Cleaning: Toms Dryer Vent Cleaning professionals will inspect and clean your dryer vent system, so you can be assured that fire hazards are avoided and your dryer works efficiently. Commercial duct cleaning can help your business save money on energy and improve indoor air quality by removing dirt, dust and debris from your HVAC system. Duct work cleaning is the first step in removing airborne contaminants and allergens out of the air you breathe.Toms Duct work Cleaning will clean from the point where the air enters the system to the point where it exits as part of our commercial duct cleaning process, which includes the grilles and registers, which helps to keep particles out of the ambient air. Duct Cleaning Melbourne improves air quality by allowing your HVAC system to run more efficiently, and help reduce the risk of fire in HVAC Systems — especially in manufacturing facilities where combustible dust is present. Contact us today on 1300 068 194 for great deals and professional service!